So... there is some discussion [url="http://forums.obsidian.net/topic/60122-stretch-goal-hire-justin-sweet-to-make-portraits/"]here[/url] about the possibility of Justin Sweet joining Project Eternity, and some of the things we've mentioned in that thread have sparked an idea. That portrait, at least to me, looks slightly inspired by the Icewind Dale style. I like it. Sure, and that supports the idea that we could have multiple artists creating portraits that share a basic style or feel to provide more variety and choice without things seeming too mix-n-matched. Indeed, as was the case with IWD I and II portraits, they were different, but shared a somewhat similar style. Have multiple portraits for each companion by different artists and build the capability to change portraits directly into the character or inventory screen. For example, after we recruit Sagani, we would be able to open the character or inventory screen and choose between the portrait released in Update 3, Kieran Yanner's take on Sagani, Justin Sweet's take on Sagani, etc. Each character could have a folder within the portrait directory where alternate player-added portraits could be placed to be selectable from the interface. To allow the player character, custom characters created at the Adventurer's Hall, and mod-added characters the same functionality, the feature could be programmed to check the portrait directory for a folder named after the currently selected character. If one is not found, it could default to the portraits available in the main portrait directory. If it would prohibitively expensive to create multiple portraits for each companion (or if funds are simply better spent on something else), would it be feasible to implement this feature but not the additional portraits (so that we can add custom portraits and be able to switch between them in-game)? The IE games allowed portrait additions and overrides, and this doesn't seem as if it would be much more complex... ? By different artists? So you want to pay different artists to have changeable portraits, despite the cost for such a menial feature. I expect that having multiple versions by different artists would be rather expensive, although of course whether it would be prohibitively so would depend on how much the artists in question charge and all. This sounds like a good idea to me. Custom portraits in general are definitely something I'm very much hoping for, because even a fairly wide range of default portraits runs out after multiple playthroughs (I don't like using the same portrait for more than one character if I can help it). Also, being able to create or find a portrait that does look how you want your character to look if none of the default ones do is part of what is great about having portraits. And, certainly, I can see reasons that you would want to switch in the middle of the game, too. I know I've done that a few times in Icewind Dale and Baldur's Gate. Yeah, I think having multiple portraits of the same characters would... It wouldn't be a waste of money as such, but you're basically getting the same thing done several times over (I think redundant is the word I'm looking for) when instead you could say give the player more portraits to choose from. As for letting players change portraits on their own characters and companions in-game? I think that does sound like a good idea, and makes it even more likely that modders and the community will provide custom portraits of their own that you can use for the companions if you want. Out of curiosity, who did the first Sagani pic--Kieran Yanner, who did the group pic? Personally, I'd love to see two complete NPC portrait sets just during the development period since we have a bunch for the KS anyway---Polina concepts (missing Sagani and whoever else), and whoever did the first Sagani painted pic, which happens to be my favorite piece of all the KS art so far. I can't find a source anymore, so maybe it's just me having imagined things, but I was sure I remembered someone from the team mentioning changeable portraits would be in. I'd guess that at the least we'll be able to add and override portraits as in the IE games. What I'm asking for here is to be able to change portraits at will from the in-game interface. I would very much like this feature myself. Josh, Adam and I discussed this. Importing custom portraits is a feature we all felt was important. We didn't discuss changing companion portraits but it will probably be supported. Not 100% sure on that one though. That is a great feature to include. Thanks for the update. Cool, good to know that. Of course we want to be able to change companion portraits, too. Haven't you ever sexed up Aerie a bit in BG2? Portraits should be featured, at least to show them in dialogue menus. But, i mean: let's move forward! We are in 2012. I would like the development team to focus on better in-game avatars for the playable characters, not just on portraits. The IE games had portraits because the engine and the available screen resolutions weren't able to show detailed models for the characters. But with the current technology and screen resolutions detailed in-game avatars with expressive faces should be a must-have. Just one thing, I really love triffling with portraits in PS so the ability to import custom portraits would be cool. Great idea, if the cost/time to implement it in-game would be too much, just making the portrait folders outside the game for companions editable would suffice. And about custom portraits, I'd like a better structured way of adding custom portraits to character creation in-game than the one in BG/IWD, a higher resolution for a bigger menu will help most of it. Having 200+ custom portraits in the BG/IWD did present me with a ton of options, but finding a specific portrait took a lot of time. Trum, trum, terum tum tum - the landsknecht and his gaudy war drum. Cases in point; Drakensang and Dragon Age. A better idea IMO instead of multiple versions of one NPC per artist would be making multiple versions of one NPC by the same artist... who express states (poisoned, stunned, fear). So you can even without icons immediately see what state a NPC is in. There is an npc damage mod made for BG2 where someone made various versions of the BG2 companions with cuts, bruises etc and then had a script to replace portraits at different damage levels. This is an excellent idea for a project with infinite money. But in reality, I don't think it would be a good allocation of resources. If Justin Sweet (for example) was to submit some portraits for free to Obsidian just to showcase his skills to the world, that would be awesome. Someone should tell him. I think they all the same. the biggest issue for me is that my character is distinct from other characters in the game. 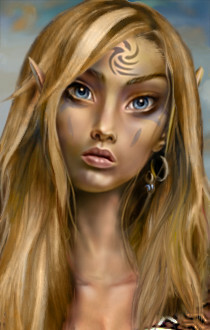 I remember being annoyed in BG2 that Imoen had the same character portrait as I did. NPC portraits should be apart from PC portraits, or at least have a note saying these can be found during the game. Yep, that's more-or-less what I'm asking for in this thread. Companion portraits could be changed for the IE games by placing files of the appropriate format and name in the override folder. We need at least that much, and it'd be great if we were able to change portraits for the PC and companions in-game at any time from the character or inventory screen/menu. Basic IE-style: Place files of appropriate format and name in override folder; only one portrait per character can be installed at a time; PC portrait cannot be changed after character creation. I'm all for being able to import portraits for all characters, not just the PC. Also, one reason I prefer the BG1/2 style portraits to IWD1/2 is that they are so much easier (for me) to copy fairly well when I do a custom portrait. I could never make anything close to fitting in the IWD style. Well I figure with the Adventure Hall and being able to create characters there, that there would be a way to change portraits in game. I thought BG2 and IWD 2 had this feature.